In 1735, a former nail warehouse on what is now St Clement's Lane in West Bromwich was purchased for £87 10s for use as a workhouse. Various extensions were made to the building which by the 1770s could accommodate 100. In 1791, to stop the inmates getting out, it was decided to build boundary wall with spikes along the top. By 1814, the building was found to be completely unfit. However, plans a replacement building were never carried out due to lack of funds. In 1766, some almshouses on Meeting Street in Wednesbury were converted for use as a workhouse. A parliamentary report of 1777 recorded a parish workhouses in operation at Wednesbury for up to 60 inmates. In 1828, Pigot's Directory records that the Wednesbury workhouse stood on what had then become known as Workhouse Lane, with William Halfpenny as its governor. 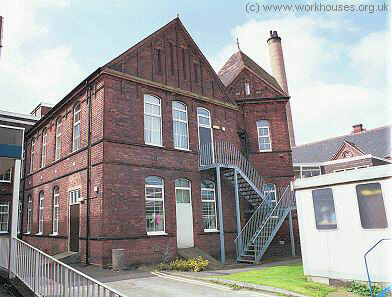 At Handsworth, a workhouse was in operation by 1811 on land purchased by the Overseers in 1794. 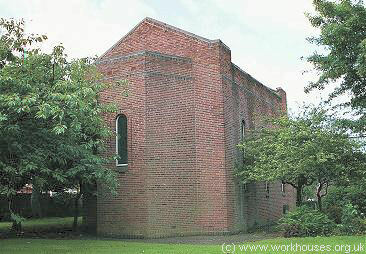 It was situated near to the old town hall, on a plot bounded by College Road, Slack Lane and Oxhill Road. County of Stafford: West Bromwich (10), Handsworth and Perry Barr (4), Wednesbury (6). County of Salop: Oldbury (4), Warley Salop. County of Worcester: Warley Wigorn. The population falling within the Union at the 1831 census had been 34,616 with parishes ranging in size from Warley Wigorn (population 921) to West Bromwich itself (15,327). The average annual poor-rate expenditure for the period 1834-6 had been £6,584 or 3s.10d. per head of the population. In 1839, the Poor Law Commissioners reported that West Bromwich one of around 35 Unions which "for the present decline to concur in providing an adequate Workhouse". 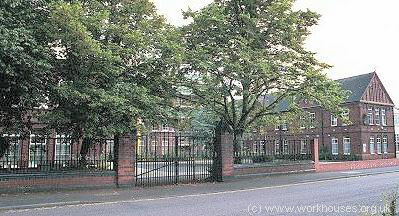 However, a workhouse was eventually erected in 1857-8 on Hallam Street at the east of West Bromwich. It was designed by the partnership of Briggs and Everall and could accommodate 820 inmates. The workhouse location and layout are shown on the 1901 map below. West Bromwich infirmary from south-west, 2000. 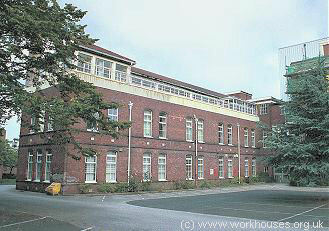 West Bromwich infirmary from south-east, 2000. West Bromwich infirmary from west, 2000. West Bromwich itch and venereal wards, 2000. In 1887, a new block containing a board-room and relief offices was erected fronting onto Hallam Street. The building was deigned by Messrs. Henman and Timmins. 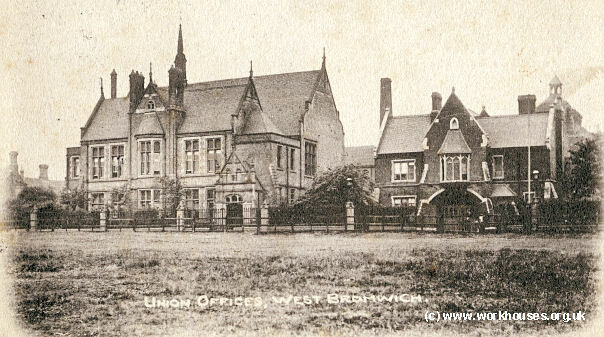 West Bromwich board-room (left) and entrance from north-east, c.1904. 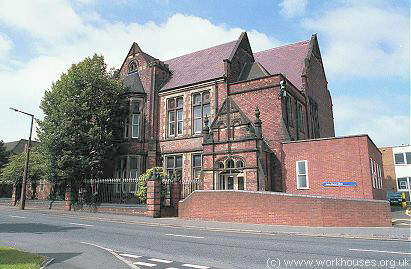 West Bromwich board-room from north-east, 2000. 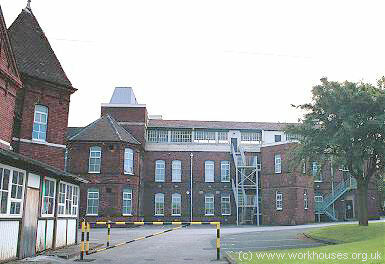 The main workhouse buildings have been demolished but the infirmary and several surviving peripheral buildings became part of Sandwell Hospital, later Hallam Day Hospital. In 1842, the Commissioners investigating the employment and conditions of children in mines and manufactories, discovered that workhouse boys, some as young as eight, were being sent on "apprenticeships" of up to twelve years working in coal mines. As a result, some unions in the coal-mining districts of South Staffordshire and adjacent areas were asked to provide detailed information on the children who had been apprenticed in the mining industry in recent years. West Bromwich recorded five such instances, detailed below, all dealt with by parish officers rather than the Board of Guardians. In every case, the boy concerned had been apprenticed, without any premium being paid, until he was 21 years old. In 1869, West Bromwich formed a partnership with the neighbouring Walsall Union to set up the Walsall and West Bromwich School District. The School District operated a district school at Wigmore. In 1911,West Bromwich again joined with Walsall to form the Walsall and West Bromwich Joint Committee for providing specialised care for certain categories of paupers away from the main workhouse. The Committee purchased Great Barr Hall at the north-west of West Bromwich and in 1918 opened a "colony for mental defectives". Sandwell Community History and Archives Service, Smethwick Library, High Street, Smethwick B66 1AA. Has Guardians' minutes (1891-1912).